Our lives are all so busy aren't they? Because I work outside my home, weekends are a very important part of my life balance. Weekends are usually full of family visits, sewing and house duties. I do enjoy my "off" time and guard it closely. Shelbie, Whitney and I went to a cooking class at my good friend and neighbor, Laura's. It was a sauce class with both sweet and savory sauces. Specifically Laura made a pork loin with meat sauce, mac and cheese, Bearnaise sauce over asparagus with caramel, chocolate, raspberry and vanilla sauce. 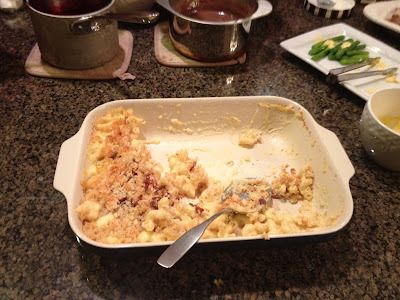 It was all delicious and we tried out some of the recipes over the weekend at our house. 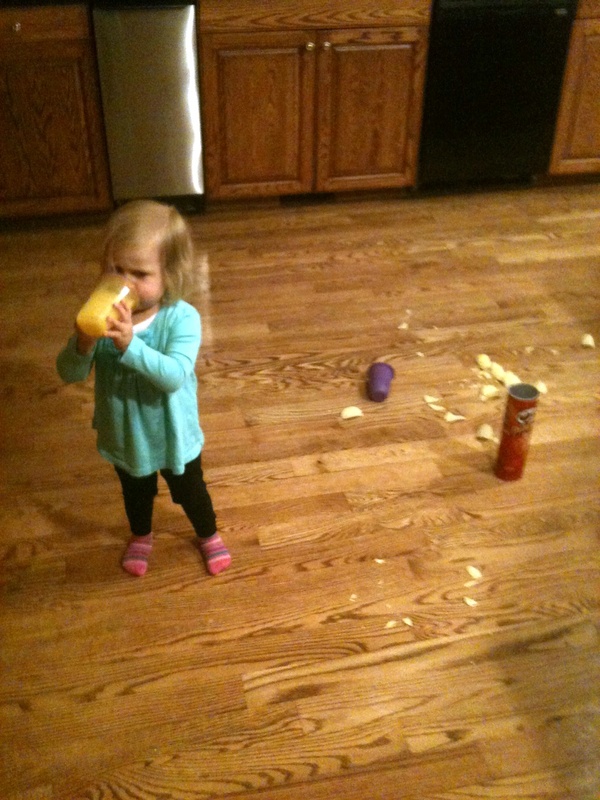 While we were at the class, Mason texted me this photo of Allison cooking up her own mess in my kitchen. Whitney, Allison's mom, isn't really feeling well at 7 months pregnant so they stayed here for the weekend. Mason had a date to the Preference Prom (girls ask guys). He had a great time. But he always does. At nearly 17, Mason lives a very social (and spoiled) life. I did a little bit of sewing and pattern writing. 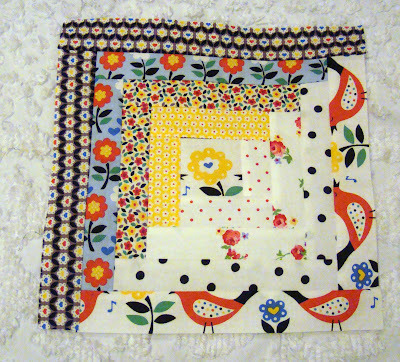 I didn't mean to cut off the bird heads in this block but I don't know that I will unpick so I'll have to pretend it doesn't matter. I always like to unwind on the weekend with a good video. I'm really enjoying watching seasons of BBC Foyle's War on my Kindle Fire. I do love a great British period type show. This one is especially good since I like to learn about WWII. Nanette, I have just received an ordinary Kindle - love it! The Kindle Fire's are not available in Oz, I'm intrigued one can watch videos on it, so it must be a cross between an ebook and a tablet? I love your block and agree about not unpicking!! I love those fabrics, very cute! Looks like the perfect weekend. 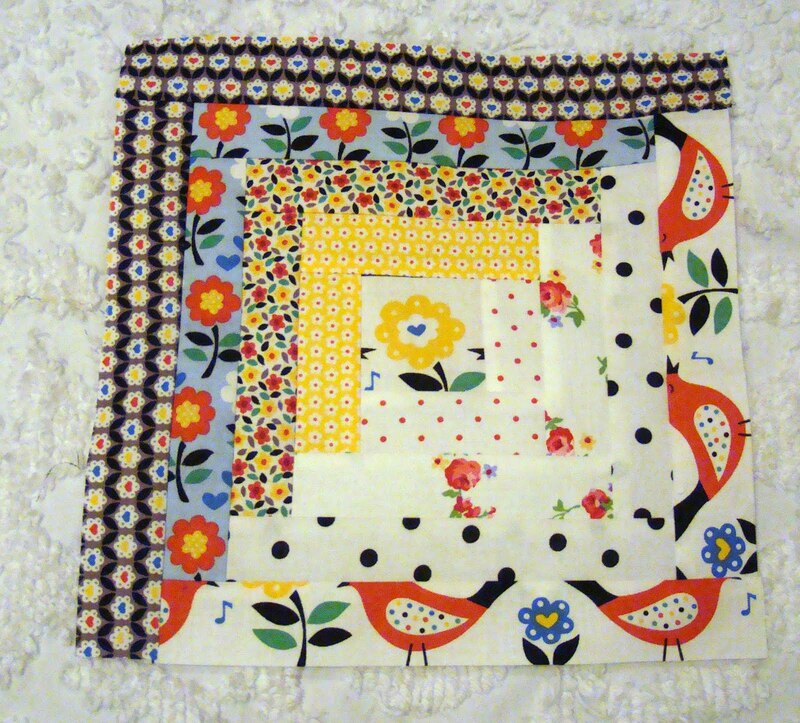 :) Love your block, even if you beheaded all those little birds. They look like paisley now! I'll have to add Foyle's War to my list of things to watch. Right after Downtown Abbey. Have a great week, Nanette! Hahaha - I'll bet you guys burst out laughing when you received that picture of Alison - too funny! And look at that cute date of Mason's - he's definitely living the life. 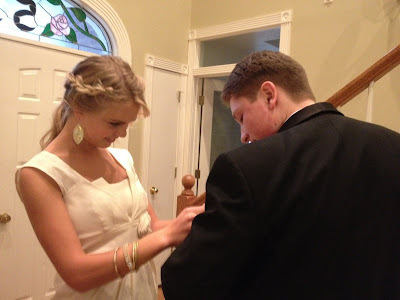 But, then, being he only boy after all those girls, how. Ould he not LOL! Thanks for the Foyle's War tip - I LOVE stuff like that! Good thing I read through the comments to see what the rest of your post was about. My eyeballs went straight to Foyle's War. I'm madly in love with BBC, PBS, NPR, LDS, MTC and OCD. If you need more british ideas or acronyms, just ask!